Mike and Tricia Viviano are both alumni of SIUE. Tricia Viviano (B.S. Mass Comm, B.S. Speech Com '02) is the Marketing Coordinator & Physician Liaison for St. John's Mercy Health Care in St. Louis, Missouri. Viviano studied Mass Communications at SIUE. While at SIUE, Viviano took internships with the St. Louis Blues as well with St. John's Mercy Hospital. Her experience at St. John's must have been positive because she has been with the hospital for the last five years and is very happy there. Viviano's profession involves marketing, public relations and outreach to area physicians. She visits area physicians and does conducts surveys to access the physician's level of confidence in the hospital. She also creates brochures, flyers and many other marketing pieces for the hospital. Viviano explains that her profession involves a lot of multi-tasking and is a constant balancing act. "The amount of responsibility and the dual role I perform is probably the most challenging part of my career," explains Viviano. "Podcasts are a great idea and very helpful in the healthcare profession," said Viviano. The digital recording of a radio broadcast or similar program, made available on the Internet for downloading to a personal audio player, enables marketers to reach audiences 24/7 and at times that are convenient for the target customer. Viviano said that technology is at the forefront of healthcare and has been the most significant change in communications that she has seen in the last five years. While attending SIUE, Viviano found Speech Communication Instructor Judy Meyer (now retired) to be very inspirational. "She had a good handle on things and a lot of great experience," said Viviano. Meyer and Viviano even kept in touch for a few years after Viviano graduated from SIUE. Viviano explained the importance of networking and getting involved in what it is that you want to do after graduating. "Never be afraid to walk up to someone and shake their hand," said Viviano. She explained how important internships are and how getting your foot in the door is the first step. By joining different organizations and meeting new people, Viviano feels that you might make a connection with someone who will be instrumental to your achieving your dream job. The last internship that Viviano completed was the beginning of her current career. Outside of her profession, Viviano volunteers on the Susan G. Komen Race Committee, a global breast cancer movement that is the world's largest non-profit grassroots network of breast cancer survivors and activist raising funds for a cancer cure. Viviano also puts her creativity to work off the job by making jewelry. She uses glass beads, metals and other materials to make beautiful jewelry that she would like to sell one day. Viviano said, "Starting my own jewelry business would be on my top ten list of things that I would like to do." 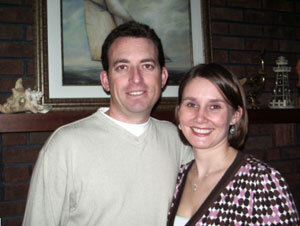 Viviano was married two and a half years ago to another SIUE alumnus, Mike Viviano (CNST `88). "He just graduated as I was just starting but it is neat that we both graduated from SIUE," she said. They did not meet at SIUE but through family and friends. When the two were married they had engagement photos taken on the campus in the quad area. "During the spring the different flowers and plants are really beautiful on campus," said Viviano.